If you prefer your head smooth and bald, the best head shavers can help you accomplish that every day! We found 10 great head shavers that durable, easy to use, and even easier to keep clean. Many of them are also great for trimming facial or body hair, so you can do a lot with just one tool – saving money in the long run! Before we dive in, here are some features to consider before buying your new head shaver. 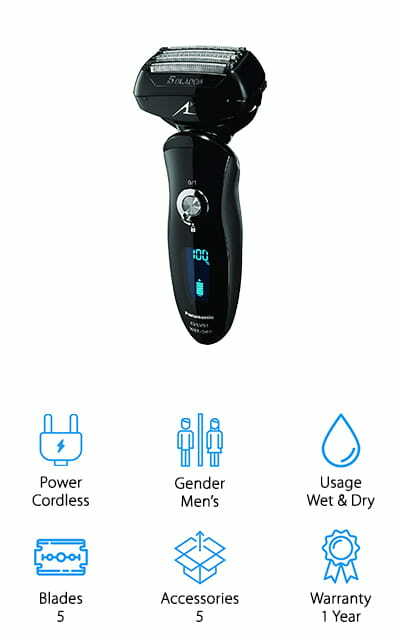 Power: All the shavers we reviewed are cordless, which is great because you can take them anywhere – the bathroom, kitchen, or even outdoors! We’ll also let you know if you can use them with a cord for endless power without recharging! 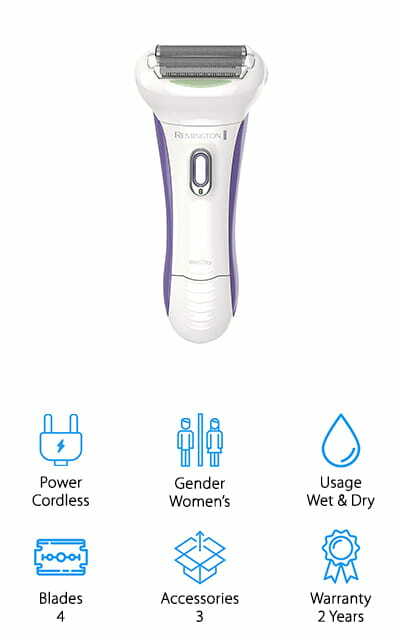 Gender: You don’t have to be a man to use a men’s shaver! We’ll tell you if each shaver is made for men or women anyway. Men’s shavers are typically larger, while smaller women’s shavers may work well around tricky areas. Usage: Want the best head shaver razor you can use in the shower? Make sure to get one that works in wet conditions with wet hair! We also found dry-only shavers, and a few you can use for wet and dry! Blades: Some of the shavers we reviewed come with a variety of blades for different purposes. There are blades that remove large swaths of hair and smaller pop-out blades to help you do edges or detail work for a perfect shave! Accessories: We’ll also let you know if each head shaver comes with any extras to help you buy only what you truly need! Some kits are just the clippers, while others have extra blades, storage cases, combs, and more fun accessories! Warranty: If well taken care of, the best head shaver clippers should last for years. However, if something bad does happen, a warranty is a good sign the company stands by their product, and they’ll replace or repair it for you. Now that you have a better idea of what to look for, let’s find you the best electric head shaver for your needs! Whether you want an inexpensive shaver, a self-cleaning machine, or a travel-friendly kit, we have great options for everyone! If you’re short on time, we totally understand! We started off with our Top Pick and Budget Pick so you can start there and come back when you have more time to read the rest! Let’s get started! Our Top Pick for the best head shaver trimmer goes to this versatile and easy to use foil shaver from Braun! This cordless shaver is perfect for keeping your bald head smooth, even if it’s been a few days since your last shave. It uses 4 blades to trim down hair growing in all directions, leaving you with a smooth head without any irritation. You can use it dry or wet – even in the shower – thanks to the completely waterproof design. The pop-up detail trimmer helps you handle delicate areas like around your ears or beard. We also like that this comes with a charging station that does a lot more than just charge the batteries! 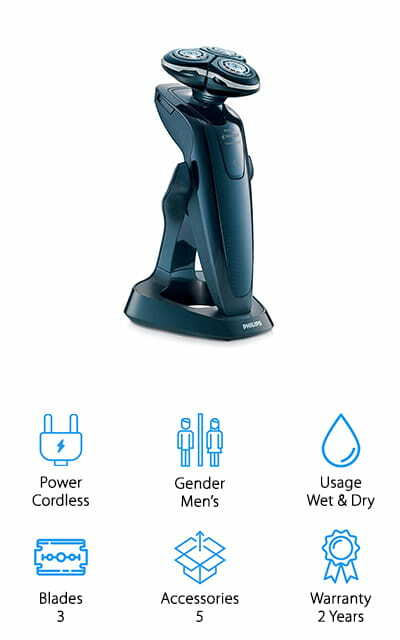 This charging station has various cleaning settings that clean, lubricate, and dry your shaver between each use. No worries about taking it apart and cleaning it each time – just toss it into the charging station, and it’ll be ready to go for next time! If you’re looking to save some money on your daily head shaving routine, consider picking up this electric shaver from Panasonic to keep your bald head looking great without spending a ton! 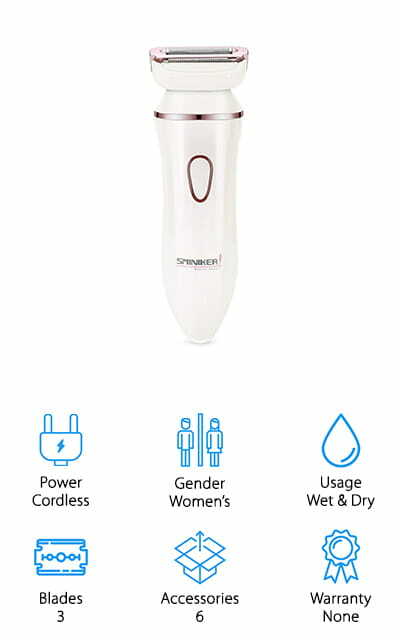 This women’s shaver is actually great for shaving your head because it’s built to handle the head’s curves and odd angles without irritation. The 2 blades are extra sharp with thin foils, giving you a super close shave, even around awkward spots around your neck or back of the head. Everything is also made of hypoallergenic stainless steel – great for even sensitive scalps! The pop-up trimmer works great for any spots you missed, or for getting around your beard or ears. We like that this trimmer works well in both wet and dry conditions, so you can shave in the shower or in front of a mirror for more control. It’s easy to wash, easy to charge, and incredibly easy to use to keep your head looking great! 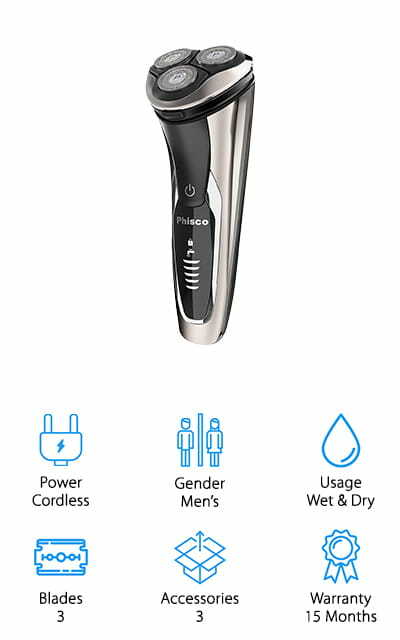 If you’re wondering what is the best shaver to use to shave your head if you have sensitive skin, consider using this electric razor from Panasonic! This razor is great for sensitive skin because it has 5 hypoallergenic stainless steel blades that grab and shave hair quickly, reducing the chances of irritation from shaving over the same area too many times. The pop-up trimmer allows you to tackle tough spots or do some detail work around facial hair easily. You can also use this razor wet or dry, so you can choose the method that is best for your skin. We also like that this comes with full-service charging station that charges, cleans, and dries your razor after every use. This ensures the razor is clean from bacteria, old shaving lotion, and other potential irritants. For those of you with overly sensitive scalps, you can get a close shave while keeping your skin feeling calm and clear of irritation! 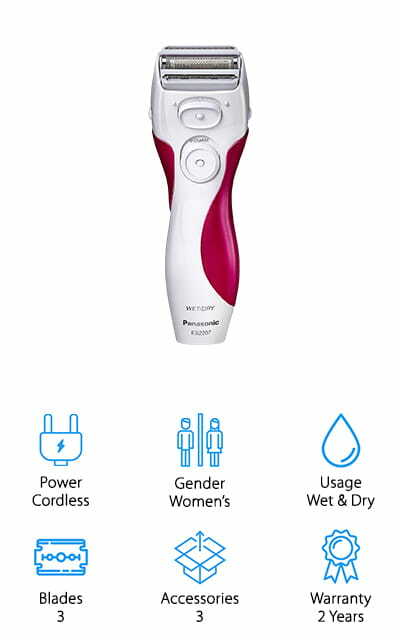 Another great option for a women’s electric razor to shave your head is this gentle, easy to use razor from Philips. We think this is a great razor to take while you travel because it’s compact and won’t take up tons of space in your luggage. Instead of a large charging dock, you charge it with a cable, which also saves space in your luggage or small bathroom. The razor itself is great – the gentle foil glides over the skin smoothly, and the anti-slip grip prevents you from dropping it or slipping up. We also like that the blades are pearl tipped, which glide over the skin instead of scraping, making this a great razor if you have sensitive skin or you’re prone to razor burn! It comes with a bikini trimmer, an efficiency guard that blocks you from using the detail trimmers, and a travel cap. It all fits neatly in a travel pouch for easy storage and travel! 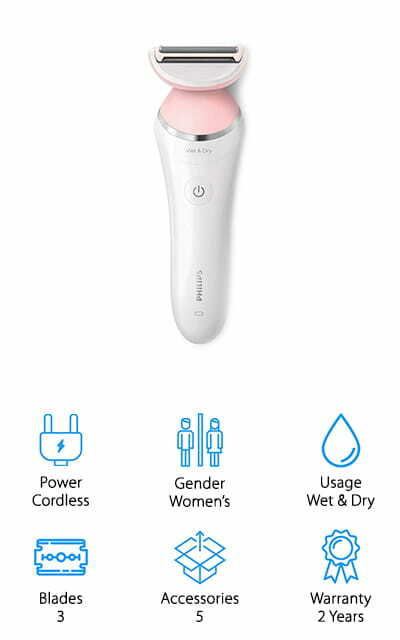 Next up in our head shaver reviews is this kit from Sminiker that would make a great gift for the beauty-minded woman or bald guy in your life! This kit has everything you need to tackle shaving your head, and a few fun extras to keep things maintained everywhere else! It comes with a 3-blade shaver head that trims hair and then shaves it down super smooth. The hypoallergenic blades are great for sensitive skin, and they’re easy to rinse clean after each use to keep them safe and sanitary. The kit also comes with a precise shaving blade and small trimmer blade to handle detail work around the ears or facial hair. To keep your skin looking great, it also comes with a face brush that clears out dirty pores quickly and gently. There’s even a manicure kit included to keep your fingers and toes looking fabulous! We think this is a wonderful kit the whole family would enjoy! If you want to take your razor on the road, this one from Phisco is great for getting a clean shave anywhere you take it! We like that this razor charges with a mini-USB cable, so you can charge it from your computer, car charger, or adapter. In just 1 hour, it charges enough for up to 2 hours of continuous use – which is plenty for doing a few shaving sessions on a weekend trip! It’s also fully waterproof, so you can use it dry or wet in the shower – or out in the rain if you want to take it on your next camping trip! We also like that it comes with a travel lock, so you can’t accidentally turn the trimmer on in your luggage or backpack! The 3 rotating blades work hard to give you a close shave without irritating the skin, and the blades are self-sharpening, so they’ll keep giving you a close shave for years. If you are looking for a shaver that’s like a traditional trimmer you’d find in your barbershop, the i-Stubble Flexhead from Conair has all the features of a hair trimmer in a smaller size. We like this trimmer because it’s great for both your head and beard, so you can keep everything trimmed with just one tool. The blades have 15 adjustment settings from 0.4mm to 5mm, so you can get the right amount of stubble you desire, or go super smooth. The pivoting head works around curves for a smooth cut in fewer passes, which prevents irritation. It also has a flip-back guide comb you can use for detail work – no need to stop shaving to attach guides! This dry-only trimmer is easy to use, easy to store, and fits into a travel pouch to pack into your luggage. The charge lasts for up to 45 minutes, and the LCD display lets you know when you need to recharge! A great electric razor that can handle both your facial hair and head can save you both money and time getting ready every morning. This razor from SweetLF works well to trim both your beard stubble and head each morning for a smooth look in no time! We like that this trimmer has 3 rotating blades that gently glide around curves and tough spaces without irritation. There’s also a pop-up detail trimmer you can use for those tough to reach places, like around the ears or nose. The quick charge gives you up to 120 minutes of shaving time, and the LCD screen tells you how much battery life you have left. We also like that you can recharge it via USB port, so you can charge it with your laptop or car charger with an adapter! It works wet and dry, and it’s really easy to rinse clean after each use to keep it working well each time! Next up in our head shaver buying guide is the Smooth & Silky Shaver from Remington. This shaver is great for those of you with sensitive skin that still want a close shave every morning. It has 4 sharp, hypoallergenic blades that trim and shave with ease, and it’s angled perfectly to sit tightly against the skin for a close shave without tugging on the skin. To help soothe your skin, it also has a strip of almond oil that moisturizes your skin as you shave – no need to fuss with extra lotion afterward! It’s also completely waterproof, so you can use it dry or wet in the shower with gel or shaving cream for added protection. It’s also antimicrobial to prevent breakouts, and it’s incredibly easy to clean between sessions – just rinse under the skin and dry! The charging station is slim and looks beautiful on your countertop, or stow it away in the included pouch in between uses! 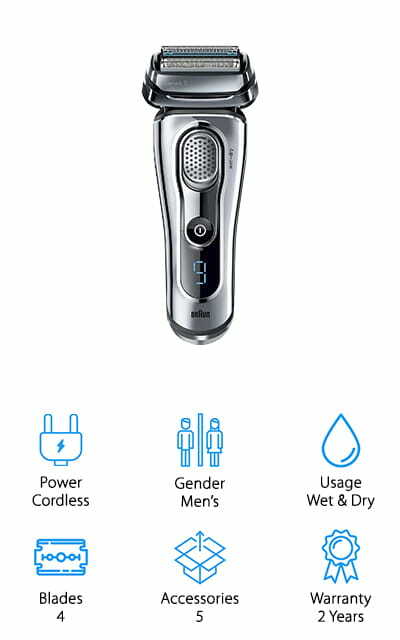 Next up is another of our favorites for the best head shaver electric razor owners will love from Philips! We like this razor for shaving your head because it pivots smoothly around your head for a clean shave. The 3 blades grab hair growing in all directions and shave them down to below the skin, giving you a polished, smooth head every time. It works well dry for a quick touch-up before running out the door, or you can take it in the shower and use it wet! 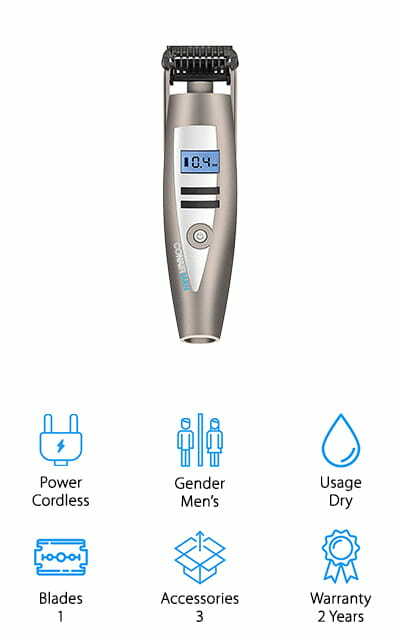 You can charge it in just one hour for up to 50 minutes of continuous shaving, or use the quick charge function that only takes 3 minutes, giving you enough power for one shave. We also like that it’s great for traveling, thanks to the compact charger, blade cover, and carrying bag that keep everything protected and clean in your luggage! This would make a great gift – or grab one for you!